Taiwan will not bow to Chinese pressure, a presidential spokesperson has said, as the self-ruled island held live-fire military drills aimed at showing its ability to defend itself from Beijing’s threats. The developments on Thursday came as China, which considers Taiwan a renegade province, has been pressing companies around the world to change the way they refer to the island amid renewed threats to use force to gain control over it. “As for China’s related out-of-control actions, we need to remind the international community to face this squarely and to unite efforts to reduce and contain these actions,” Alex Huang, the spokesperson for President Tsai Ing-wen, told reporters in Taipei, according to Reuters news agency. 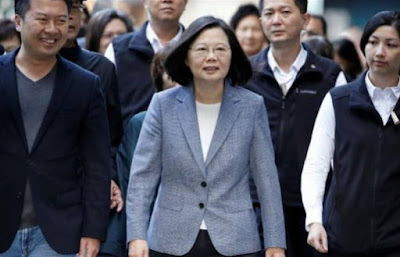 Chinese nationalists fled to Taiwan at the end of the civil war in 1949 when the Communists took control of mainland China, but as the island has transformed into one of the region’s most vibrant democracies it has become increasingly assertive of its own identity. The mainland’s Civil Aviation Administration has insisted airlines change the listings on their website to show Taipei as part of China. Some, including British Airways and Singapore Airlines, have complied. The Global Times, the tabloid of the party’s People’s Daily, reported on Wednesday that 66 companies including Facebook and Nike continue to list Taiwan as independent from China, citing the work of two Chinese government think-tanks. One of its authors accused the multinationals of undermining China’s sovereignty by listing the territory separately. Beijing has stepped up pressure on Taiwan since independence-leaning Tsai won presidential elections in 2016. On January 2, Chinese President Xi Jinping said no one could change the fact that Taiwan was “part of China”, adding that Beijing would not give up the use of military force as an option to ensure the island’s “reunification” with the mainland. On Thursday, Taiwan held live-fire military drills, the first since Xi’s comments some two weeks ago. Artillery and assault helicopters fired at targets off the west coast city of Taichung, while Mirage fighter jets took off amid rainy conditions from the air base at Hsinchu to the north. The exercises also followed a new Pentagon report laying out US concerns about China’s growing military might, underscoring Washington’s worries about a possible attack against Taiwan.